Today I did something I rarely do, I exposed most of my upper body to the sun! I kept my under clothes on, and my track pants, but I exposed some flesh to the lovely and blessed sunshine. This unusual event occurred in the backyard, which is pretty private anyway, so if anybody copped a view of a little more than they were expecting, then they probably got more than they deserved! I was out there with husband and our dog Missy, while washing was being hung up, and then our Canna plants watered. I looked at the mandarin tree while I was outside, and it certainly looked like it needs the watering it’s getting right now. We are forecast to have some much hotter weather in the next few days, and we need to make sure these plants get what they need. Sunshine is certainly needed by plants for the photosynthesizing process, but correct watering is important too, very important. Humans need proper hydration (water) too. At the moment, I’m working on my second glass of water for the day, and I’ve had a cup of coffee first up, as I almost always do. That coffee counts toward my needed water intake, up to a point. I feel that if I have three cups of coffee, and about three glasses of water, that is probably enough for my needs. Rome wasn’t built in one day, as they say, and my aerobic fitness is a work in progress. Getting sufficient sunshine is a work in progress too. I am slowly reducing my layers of clothing, after the cold of Winter and early Spring. I like to be warm, rather than being cool, other people prefer it the other way around. I have MS (Multiple Sclerosis), and it is felt by the experts that vitamin d, at least the lack of it, may have a negative role in my disease. Having adequate vitamin d is felt to be healthful. So, if I want to be as healthy as possible, it is a good idea to receive vitamin d from the sunshine, whenever I can. It’s a balancing game, this one though. I have also had skin cancers (in the early stages) removed. Sunshine brings both skin cancer and vitamin d, one bad thing, but one good thing too. So, I know that getting my sunshine for vitamin d in the morning and later afternoon is the best way to go. In the middle of the day, the sun is at its most dangerous level for skin cancer. I think I have the knowledge to make this work best for me. On another level of being, sunshine simply makes me happy. I love what it does for the plants, the vegetables, the lawn, the trees, and the flowers. I feel so fortunate to have enough room, at my place to have all of these things, at our place in the country, with no tall buildings cutting out any of that blessed sunshine. And of course, we have solar panels on our roof, and every moment of sunshine brings us more power for ‘free’. We’ve had our panels now for long enough to have covered the costs of their installation, so it is free actually, no need for the quote marks. Sunshine’s power helps to pay for some of the power we use, and I love that idea. I also love the fact that every bit of solar power we use is other, more worrying forms of power we don’t have to use. In Winter, sometimes the day can start out being dark and not get much lighter during the day, because the sky is too cloudy to let the sunshine in. Other days, the shu can rise in a sky that gets bluer and bluer, all the way through to sunset, and a clear star-filled sky. Other days can be like today. We had a nice sunrise (I assume, I slept through it), then we had a lovely blue, right up until the clouds came along and things got darker. Often dark and cloudy skies at least have the benefit of bringing rain to help to freshen up the garden. Not today though, not here anyway. We haven’t been getting that much rain really, considering the season it is. One tends to thing that winter is when there is lots of rain, rain, and thunderstorms. But as at now, the rainfall for Winter seems to be lower than for other years … Of course, we have hoses and water available at the turn of a tap, so our plants will still be OK. A bit of rain in winter is still appreciated though, for sure. But these sunny times in Winter are appreciated to, by many. I’m not a farmer, and I imagine the farmers in my part of South Australia would like to see some more rain. The crops are coming up, so there paddocks are showing green, but if more rains, and heavier rains don’t follow up on the rains we’ve already had, I suspect the crops would suffer. I hope Nature brings that needed rain. We hope so too, we have our own ‘crops’ as I’ve written about before. The mandarin tree, the two vegetable plots, and our saltbush plants, the all need water, the saltbush plant not needing as much though. Saltbush plants are saviours in some areas, when and if the rain doesn’t come. They manage to grow well enough, on little or no rain, offering food to herbivores, when there is little else available. And the saltbush doesn’t seem to mind the sun, it doesn’t seem to suffer at all, even in summer, when most of the other plants can show signs of distress. Having some plants like that is a good thing, for a garden. Succulents are like that too, they can keep on going through harsh times. 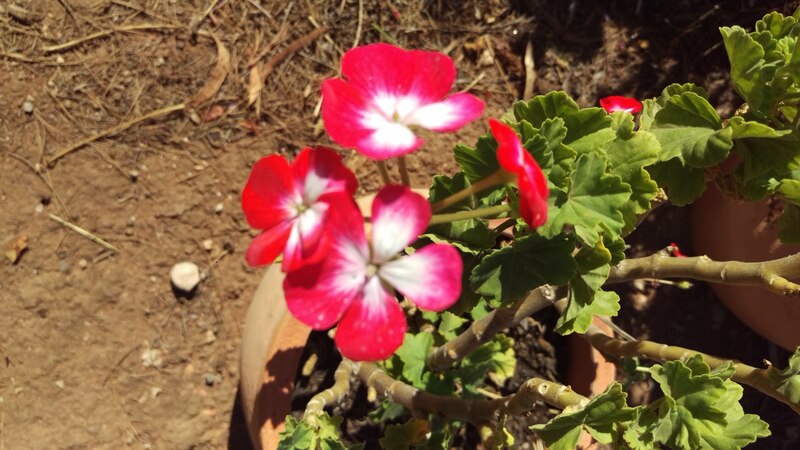 So too can geraniums, and they have the added bonus of flowers of various colours. All in all, our garden this Winter has had a good range of sunshine and rain, and I’m looking forward to what Spring might bring. I love following along with how things are going at our place, and also how the birds around us are going. Of course, they are dependant on Nature for rain, although we help them out a little, with three bird baths, and also have the swimming pool, that some birds drink from, mostly sparrows and swallows. Interesting things, birds, and flowers and trees. And of course, the sky blue, or clouded, or star filled. Lovely, all of it!